Ok, so the financial pay out isn’t as high as it would be at the horse track, but the feeling of accomplishment is even better. When I woke up this morning and checked the paper as I usually do, I saw something that I haven’t seen in quite a while, if not ever. 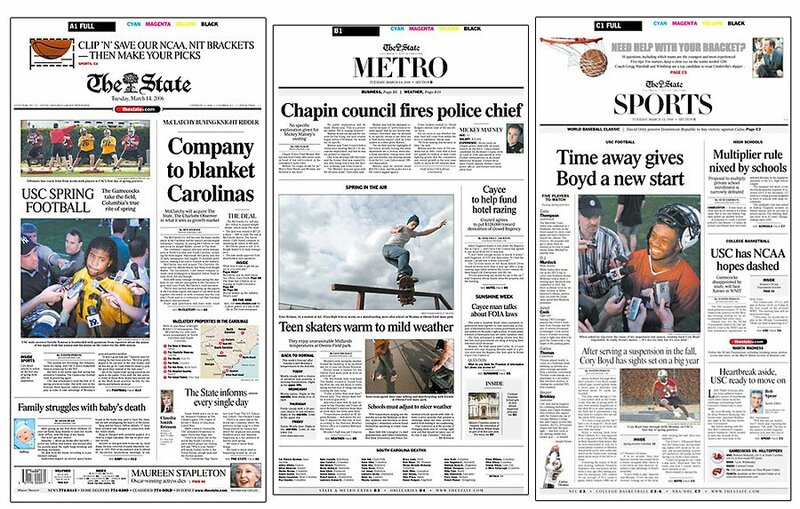 My images adorning the dominant location on the front pages of the three major sections (Front Page/A1, Metro/B1, and Sports/C1). What makes this even better is that when I woke up on Monday morning I had no idea that I would even shoot an assignment. But all of this didn’t come together without some planning and extra work. At about 2pm, two minutes after I left the news room from turning in photos from an assignment I shot over the weekend I got a call on my cell phone from the director of photography at The State, “Before you get too far away turn around and come pickup the reporter,” were the first words out of his mouth. Arriving back at the paper a few minutes later, I found out that the Metro centerpiece had fallen through and we had to go on a feature hunt to try and fill it. This is when having the idea book that I always carry with me, really saved our butts. The assignment was to find what high school kids do after school on the first really nice day of spring, and the first place we tried turned up no kids. I guess these days kids just go home to play video games, check email, IM with friends, or participate in after school activities, because after 30 minutes of driving around we couldn’t find any kids out and about. So referring to my little black book I found that I had jotted down the words “Owens Field Skate Park?,” and we headed in that direction. Thankfully we founds some really awesome kids that we hung out with and shot photos of for about 45 minutes, which turned into a nice spring day slice of life. After that was turned in, I overheard that University of South Carolina head coach Steve Spurier had called the first day of spring football practice a day early, so I headed over to the practice field to just shoot some photos for myself, or stock of what was going on. Having also overheard that access was really tight and the staff photographer who was already out there hadn’t gotten much, I planned on just shooting some nice fan features. But when practice ended the gates were opened and a media frenzy ensued. Seeing the rush of media, encircling the key players after they completed practice, like vultures circling a dying animal I decided to hang back and see how the players reacted to this, and that moment of pause paid dividends in the moments that I got. After leaving the practice field, knowing in the back of my mind that the staff photographer hadn’t gotten good shots of the players faces, and really thinking that the media circus was actually the real visual story, I called the director of photography at the state again, and let him know what I had. After some quick, and tense moments of editing and captioning on deadline I walked out knowing that I had something that they were looking for, I walked out of the news room for the third and final time on Monday night. Even if I didn’t get the sections fronts, I knew that I had put in the extra effort and it had paid off in my personal satisfaction with a job well done, but now is no time to get over confident, and rest on my laurels, because my small victory today, will most certainly be forgotten or on the bottom of the bird cage by tomorrow. So I’m off to make calls and find out what else is going on so I can hopefully have another victory to add to my tally in this battle I have going with photography.